The news, though ground-breaking, went largely unnoticed. The Vatican has given its clearance to open the cause on May 3 for the canonization of Dom Hélder Câmara, the “bishop of the poor” and one of the most influential Latin American church leaders of the 20th century. Cardinal Angelo Amato, prefect of the Congregation for the Causes of the Saints, transmitted the Vatican’s nihil obstat (clearance) to Archbishop Antonio Fernando Saburido, O.S.B., of Olinda and Recife, Brazil, the diocese where Dom Hélder was archbishop from 1964 to 1985 and where he died in 1999. The formal request to open the cause was submitted to the Vatican in May 2014 by Archbishop Saburido with the unanimous support of the Brazilian Bishops’ Conference, who had already taken that stance in 2009, the centenary of Dom Hélder’s birth. He cited “the pastoral work of ‘the bishop of the poor’” and his untiring activity in favor of human dignity, social justice, peace and the rights of those suffering from poverty and misery. Born in Fortaleza on Feb. 7, 1909, one of 13 children, Hélder Câmara was ordained a priest in 1931 and quickly became involved with the plight of the poor, social justice and the question of education in Brazil’s northeast. He soon saw the need for the country’s bishops to be united and work together in a national conference and personally presented the case for this to Msgr. Giovanni Battista Montini at the Vatican’s Secretariat of State in December 1950. Montini liked Dom Hélder’s simple, direct style and concern for the poor and gave his approval. The two became friends. The Brazilian Bishops’ Conference was set up in 1952, and Dom Hélder became its first general secretary (1952–64). That same year Pius XII appointed him auxiliary bishop of Rio de Janeiro. Soon other bishops’ conferences were set up across Latin America, and in 1955 the Council of Latin American Bishops’ Conferences (CELAM) was established (again with Montini’s approval), the first of its kind in the world. Montini was elected pope (as Paul VI) in June 1963, and nine months later he appointed Dom Hélder as archbishop of Olinda and Recife, in Brazil’s poverty-stricken northeast. That same year the military took power and ruled the country until 1985, the year he resigned. The joyful, humble, diminutive and fearless pastor lived in that diocese for the rest of his life in simplicity and poverty, showing great love for the poor, who considered him their brother. From there, he challenged Brazil’s military rulers for their denial of civil liberties and ill-treatment of political prisoners. He stood up for democracy despite threats to his life and at the expense of an ecclesiastical career. The military ostracized and denounced him as “the red bishop,” and in this context he famously remarked: “When I feed the poor they call me a saint. When I ask why so many people are poor they call me a Communist.” He became a nonperson in Brazil; the media could not even mention his name. Renowned at home and abroad for his defense of the poor, advocacy for nonviolence and promotion of human rights and development, he participated in the general assemblies of CELAM at Rio de Janeiro (1955), Medellín (1968), Puebla (1979) and Santo Domingo (1992). Responding to invitations, he traveled the world promoting justice, peace, nonviolence and a new economic order. A great communicator, author of 22 books, he inspired many to work for these causes. In 1985, on reaching the age of 75, he handed in his resignation. John Paul II quickly replaced him with a very “conservative” bishop, Dom José Cardoso Sobrinho, who set about undoing his predecessor’s work. Dom Hélder watched, suffered, but remained silent. He died on Aug. 27, 1999, but his memory lives on. Pope Francis remembers him; they have much in common. Addressing the Brazilian bishops in Rio de Janeiro in July 2013, Francis recalled “all those names and faces which have indelibly marked the journey of the church in Brazil” and listed Dom Hélder among them. That was significant. Along with Oscar Romero and Dorothy Day, we will now have some "saints" to show the way of solidarity with the poor in a complex political environment. This article also appeared in print, under the headline "Call Him a Saint?," in the April 27, 2015 issue. 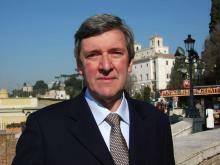 Gerard O’Connell is America’s Rome correspondent. America’s Vatican coverage is sponsored in part by the Jesuit communities of the United States. Twitter: @gerryorome.